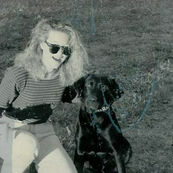 As a dog lover since childhood I have had the pleasure of spending time with some great dogs. My Grandmother and Grandfather raised Poodles, Pekinese, Pomeranians and Cocker Spaniels all their life. It skipped my mothers generation but we always had more than one family dog. When I was young I played in the front yard teaching my two Collies to do trick so much I have clippings from the newspaper where they have written articles about me and my pets. I was never fortunate enough to be in any dog shows except parades and pretend dog shows with my friends and family, but I sure had a lot of fun dreaming. With all these special pets that was lent to me by God I was blessed with only one true companion and that was Sniper (He always gave me unconditional love). I first saw Sniper at a neighbors house. Someone had dropped him off. My love for labs began that day when I adopted Sniper. He was around two years old, untrained, not housebroke and on his way to the animal shelter because the neighbor couldn't keep him. I saw something in his eyes, I new he needed me. But I was wrong, it was the other way, "It was sniper that was need in my life." 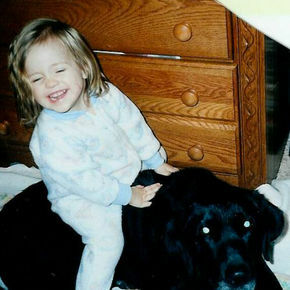 I had such a happy youth with all my pets. Although my most memorable memories are about Sniper and how he looked and acted. Sniper had a face that always looked liked he was always in-tune with what I was feeling! And his tail always wagged no matter how bad the circumstance. There are no adequate words to describe the bond that we shared. You could just look into Snipers eyes and see right down into his heart and soul. My shadow is gone from my life, but never absent from my heart. I will always have my memories. Wonderful memories of Sniper shadowing me through my life. Memories of Sniper always beside me in good times and in bad. Sniper pulling me in a sled when it snowed. Of him coming home smelling like fish from his daily swims in the pond out back. Even when it was cold. Sniper being there with a stick in his mouth wanting to play when I came home from my first job. Memories, riding my horse Dream with Sniper running beside us. Special memories of pouring concrete and leveling it for my first Kennel of three Labs. With Sniper being Sniper and running through the wet concrete leaving his paw prints. Which is still at my mothers house today. 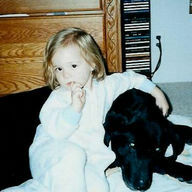 Memories of being pregnant with my first daughter and Sniper being there when I was worried and when I was happy. Memories that I can still see of Sniper with my first and second daughter sitting on him and ridding him like a horse. Some of the fondest memories in my life will always be of Sniper growing old beside me. 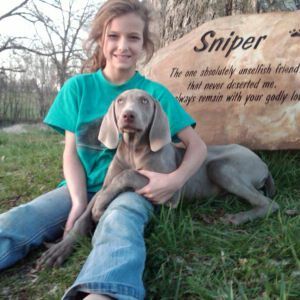 My daughters are also lucky to have fond memories of Sniper. Sniper always loved them unconditionally the same way he loved me. He showed it every day he was lent to me by God. 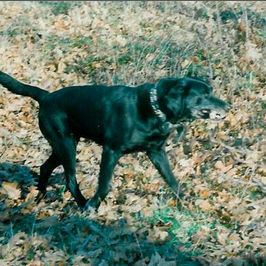 Sniper was by far the most complete dog that I have been fortunate enough to own. He was absolutely without a doubt the most amazing devoted, brilliant, funny, hard working best friend I could have ever asked for. For most of us, a puppy that grows older with us can play a very unique and important role in our lives, loving us unconditionally and offering us continuous companionship, acceptance and devotion. Because of Sniper's unconditional love I am dedicated to raising the best Labs I can. In the hope that others will have the privilege of owning this wonderful breed.